Memorial Day is more than a day off of work and the official start to summer. 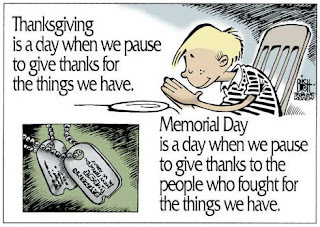 Memorial day should be a day spent reflecting on all that is good in ones life and appreciating those who risked and those who gave their lives in order for us to have the privilege of even attempting to find that which would make us happy! Thank you to all the veterans who will carry their scars, both visible and those unseen, and who gladly stood between us and those who would destroy us. And to those who gave that last full measure of devotion......that is a debt we will honor by never taking our freedoms for granted. To those of you in the United States, most of you probably do not have work or school today. I have spent much of my life reading and studying history. A subject that has always fascinated me was that of the Presidents of the United States. They are not kings or dictators and unlike any other nation prior, are elected by the people. What is the most remarkable about the Office of the President in the United States is the transition of power between old and new Presidents. George Washington was the only President who was not aligned with a political party. Despite his warning, stated in his farewell address, those competing for the presidency have been at odds with one another over party issues ever since. Despite this, there has been a peaceful transition of power with each Presidential election. The peaceful transition of power is evidence of the skilful designing of the United States Constitution and the balance of power spread between the three branches of government. The President is the Head of State, but if there have been laws or increases in governmental powers that WE the People have not liked, there are more people to blame than just the President. If that is not the most understated phrase, then I am just doing it all wrong! Heck, I probably am. Oh well, my new outlook on life is to just keep on trucking. Look where it has gotten me thus far. I am just three weeks from earning my first degree. When I started on this roller coaster it seemed that I had boarded a ride that would never end. People would say that at least there was light at the end of the tunnel, but I felt like with the way my luck always seems to go, the light would probably be a train! But now I see that light, and by golly it even looks like daylight. Keep on trucking, thats what it is all about now, keep on trucking. Kids lives are topsy-turvey and you feel their pain along with your own, keep on trucking. Seems like every class decided to load up all of their assignments at the end of the semester, keep on trucking. your "right now" job asks yo to choose between your school and committing to more work, keep on trucking. Cuz, what else you gonna do? Life may be complicated, but its all worth it in the end. Even if our reward is not in this life, it WILL come. And none of these have to cost any money. Have a great day blog stalkers! We need balance in everything right? Well, add in a little perspective and I think you have a recipe for success. I do not even know who I am any more. Not that I am becoming someone I do not recognize, but I have a hard time dealing with reality nowadays. Not the reality of the spouse or the kids. Not even the reality of work and school on top of everything else. It is the reality of the absolute certainty I have of the existence of God, Heaven, and the ability to be with our loved ones again. My life changed forever earlier this year. A loss that hurts every time I even come close to thinking about it has changed the way I look at everything I do. I find myself pushed to do more. More than I maybe can do. But if I do not even try, I feel that I am falling short of the time I am blessed to be upon the earth. And then I have the waves of worthlessness that will wash over me. I will feel like I need to stop working so hard because in the end none of it matters. But it all does matter. It does not matter if I make the most money, live in the fanciest house, or have the nicest car. What matters is that I was not idle. I want to be able to say I did not waste the time I was given when there were others who did not even get to grow old. All in all, I am busy, I miss my family, but I am trying to arrange things so that I can balance everything and still work towards the goals I have set for myself. It will not be easy, but I really think it will be worth it. Life throws you curve balls. It's just a fact. If we do not jump out of the way, they can knock us around and may sting for a bit. But get up swinging! This life is but a mere moment in the eternalness of the universe. So, if you are down and out right now, remember there is definitely someone more down and out than you. There are some days you can't help but ask... I got out of bed for this? "Where`s your other sock gone?" Falling in Love with Writing Again! "Hell's a mild climate. This is Hell's kitchen"
Now That I'm Living In "Bethany Home"
Leave your URL in a comment and I'll Stalk your blog too!